The book will be a fundraiser for the Make A Wish charity www.makeawish.org.au and will be a celebration of motherhood, and to recognise the amazing contribution and loving bond that mothers have for their children. Your $51 per family participation fee, will be forwarded in full to the Make A Wish Foundation. Our target is to raise $20,000 for the charity. Once your registration is received, a photographer will contact you to organise a time for your complimentary photography session. PLEASE NOTE ; The photography session can be anytime up until the end of October, but you must register before the end of July 2019. Every participant will have one of their photographs featured in a beautiful book called “A Mother and her Children” which will be a celebration of the loving bond between a mother and her children. Wherever life takes you over the years, your family portraits will serve as a timeless reminder of your memories. In a fleeting single glance, family portraits can transport you to the moment when you were surrounded by family, love, and support. OVER 425 MOTHERS REGISTERED IN 2019. SORRY REGISTRATIONS HAVE NOW CLOSED FOR 2018, and re-open in 2019. 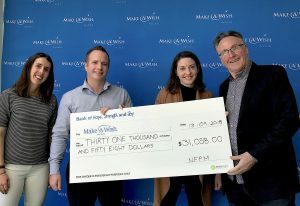 Very proud to be able to hand over a cheque for $31,058 to Make A Wish Australia yesterday, the proceeds from National Family Portrait Month 2018. Pictured below…..
Sally Bateman, CEO. Joshua Donchi, National Manager of Community Fundraising and Events. Torren Woolley, Community Engagement Coordinator. Bernie Griffiths Founder, National Family Portrait Month. Putting a smile on a seriously ill child’s face…. Archie, 6, has spent much of his short life in hospital as he battles a life-threatening heart condition. At just three months old, he had his first open heart surgery – with 12 further surgeries since then. Much of Archie’s day-to-day life consists of hospital stays and specialist visits, resulting in many missed days of school and playing with friends. “Thanks to National Family Portrait Month I finally now have some great photographs of my family, that I had been putting off having done for years. The photographs hang proudly in my home.” Pam Wright. ” My seriously ill son Matthew who has Marfan Syndrome, received his wish from Make A Wish, and I will never forget the joy on his face when we went to Movie World on the Gold Coast”. Jackie Brown.